Trimage Image Compressor is Cross-Platform App with Simple Graphic User Interface and Commad line based. 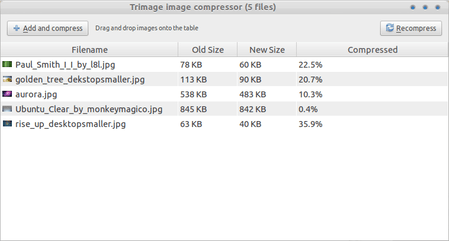 by using Trimage Image Compressor you can compress and optimize images highest compression level. Trimage Image Compressor only supports for PNG and JPG file. There are two alternative ways to install Trimage Image Compressor in ubuntu, you can install via USC (Ubuntu Software Center) or Via PPA ppa:kilian/trimage. How to Use Trimage Image Compressor ? How the results image that has been in compress using Trimage Image Compressor ? If at first glance, in my opinion there is no difference between image quality when, before being compressed and when it is compressed. With the same dimensions, the level of sharpness both conditions seem no different. I do not know if in the opinion of graphic design. for me, compressed image quality of this application does not disappoint.